EARLY DISMISSAL TODAY, THURSDAY AND FRIDAY! CLASSES END AT 12PM DUE TO TEACHER TRAINING. To provide our students with tools, experiences, and challenges that instill moral courage, develop their unique skills, and allow them to reach their full potential in a dynamic world. For all EA students to achieve their full potential and become responsible global citizens. The ideal EA whole child is an individual who, guided by our core values and a clear sense of self and well-being, seeks to become a responsible member of society and an active global citizen. The EA whole child will continually strive to improve, be reflective and inquisitive, be accepting and respectful of others, and be genuinely inclined to serve his or her community. The EA whole child is equipped with communication, collaboration, critical thinking, problem solving, information literacy, adaptability skills, and a high level of self-efficacy; the whole child is committed to achieve his or her full potential. The Escuela Americana’s Code of Conduct is the foundation upon which we build our lives in this learning community. The Code drives our actions and our policies in achieving our educational mission. The Code of Conduct is not, however, a disciplinary system. 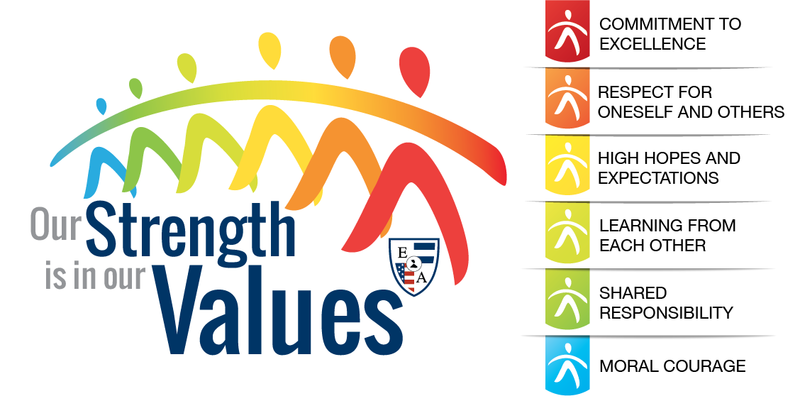 It is a set of expectations and values that frame our lives together in our school. Tell the truth; be genuine. Care for our school and community. It is and shall remain a privilege, not a right, to be an Escuela Americana community member, therefore I accept, understand, and agree to live under the Code of Conduct spirit. If my behavior puts my well-being or other’s well-being at risk, or has a negative consequence for our Escuela Americana, the school has a right to intervene. Rooted in the Code of Conduct and an important part of Escuela Americana’s history is the Honor Code. The EA Honor Code is a clear statement of fundamental expectations that form the foundation of academic and personal integrity. Compliance with the EA Honor Code is a fundamental expectation for all EA community members, and failure to comply will result in discipline sanctions being imposed. I will not lie, cheat, or steal, nor will I tolerate those who do.